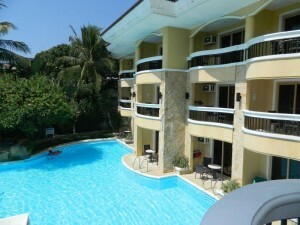 Boracay is home to a number of different resort and hotel options, many with great reviews, rooms and amenities. But each accommodation option is very different, causing them to fall into various ranking categories. On this site, we only focus on the more popular and higher ranking resorts, but we’re taking it up a notch by listing the best of the best. 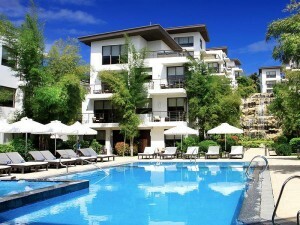 Below you’ll find a list outlining the best 5-star resorts to choose from within the island of Boracay. Each resort may be different from the next with different nightly rates, amenities, room features, restaurant choices and locations, however each promises 5-star service, great views and an experience to remember. But it doesn’t just end with a promise as each resort is backed by great reviews across the board, helping each resort to secure its spot as one of the best 5-star Boracay resorts to stay at. With an impressively large number of resorts and hotels to choose from on the island, there are lots of price and star ratings to choose from. Though this is great as choices are near endless, it can also make for a time consuming venture just to find hotels that cater to your particular vacation desires. For those who are looking for a luxury 5-star resort, we’ve gathered a list of the top choices found on the island, below. A smaller beachfront resort with 50 rooms, the Ambassador in Paradise resort offers ample room for romance and relaxation with large rooms, a restaurant, a spa and a nice list of resort features. Due to the small amount of resort rooms, guests will have the opportunity to experience more of a private stay as there is less of a chance of running into crowds of people within the resort’s bounds. Within each room there is free Wi-Fi, a flat screen TV complete with satellite channels to enjoy, modern furnishings, bath amenities and the luxury of a private balcony. Outside of the rooms, guests will find a gourmet dining restaurant that is open throughout the length of the day offering Italian dishes and wood-fire pizza. Guests commonly rave about the resort’s restaurant and love how they can dine there after a relaxing massage in one of the outdoor massage tents located near the pool area. Other great things to do are swim in the swimming pool, enjoy a day on the beach, relax in the on-site jacuzzi, have fun on the water with one of the offered water sport activities or enjoy and free electric shuttle ride around Boracay. Though the rates are a little higher than some other resorts on the island, they seem well worth it as the reviews are some of the best on the island with many guests loving the quiet location, free shuttle and privacy offered. A 5-star resort with a large amount of rooms to choose from, the Boracay Regency Beach Resort is a great choice for those who love to be in the heart of all the action. Located in Boat Station 2, guests will be close to shopping, dining choices and tons of activities and attractions such as water sports and D’Mall. There are 285 rooms in 9 different categories including a Family Room option. No matter the room choice, each room comes with a TV, hair dryer, a coffee and tea making area, Wi-Fi (with additional fee), air conditioning and 1 queen size bed or 2 single beds. The resort also offers an impressive amount of bars and restaurants to choose from, 5 in total along with the option of enjoying room service. Prepares one of the main attractions within the resort is the Kai Regency Spa which features a variety of treatments and massages. In addition the resort offers a laundry service, towel service, welcome drinks, a mini shop, several swimming pools, fitness facilities, airport transfer and access to the beach. With great rates, room choices, amenities and a spa, it’s easy to see why travelers flock to this particular beachfront resort. Large rooms, an assortment of restaurants, a pool, a spa and a kids room make the Discovery Shores Boracay resort top notch with a 5-star rating. Here guests will find 88 rooms, each with 24 hour room service, a 32 inch TV, a refrigerated private bar and a coffee/tea making area. In addition, each room comes with a few little extras including an iPod dock, voice mail and down pillows allowing for a very comfortable sleep. For those who are traveling with a group or kids in tow, there are 2 bedroom options available as well. Adults will enjoy the on-site spa which offers an assortment of massages and treatments, the pool, library, gym and various restaurants and bars. There is also the Sandbox Kids room on-site, great for when parents need a break from entertaining their children. With strong reviews detailing how luxurious and comfortable both the resort and rooms are, it seems that the high nightly rate is well worth it. 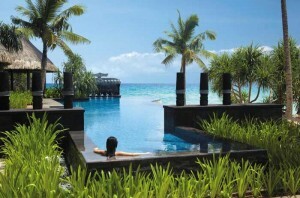 In fact, many guests plan on returning for a second stay, helping to make this resort a very popular one. One of the largest resorts on Boracay, the Henann Garden Resort is a 5-star resort featuring activities and amenities geared toward both families and couples. 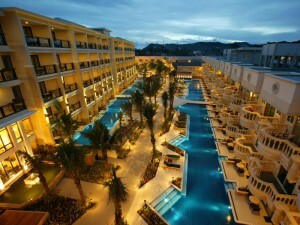 All in all, there are 273 rooms in 7 different categories, some with direct pool access. Each of the rooms come with a TV, international channels, air conditioning, a refrigerator (great for leftovers), a coffee and tea maker and daily complimentary drinking water. The refrigerator comes in great use for those who like to bring some of their dinner home with them or even a dessert. On-site there is a cafe and a bar, making the need to venture off the property for food less great. The resort also features Kai Regency Spa services including treatments and different types of massages, a business center, laundry service, 24 hour security, 4 different swimming pools, a mini shop, baggage storage and access to the beach. With a large number of raving reviews, it’s easy to see that a 5-star resort really can be budget minded as prices are much lower than other similar resorts in the area. The resort’s location in Boat Station 2 is also very attractive as guests are close to everything town has to offer, making for an even better stay. With a total of 50 rooms, the Monaco Suites de Boracay Hotel is a smaller sized 5-star hotel that is raved about time and time again. 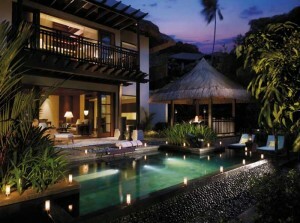 In fact, this hotel is thought to be one of the more popular hotels on the island, even with its higher nightly rates. One of the most attractive features of the hotel are the rooms which come as 1 bedroom or 2 bedroom suites. Both bedroom sizes come with a king size bed, separate living room, a bathroom styled with a separate shower and over sized sink, a fully fitted kitchen, Wi-Fi and a private balcony offering a great view of the ocean. Outside of the rooms, guests will find a restaurant, a swimming pool, jacuzzi, gym, tennis courts, a garden and a variety of water sports to partake in. 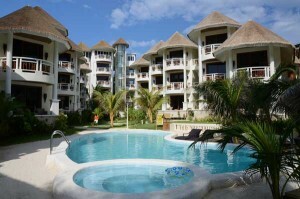 The hotel also houses the number one spa in all of Boracay, the Bella Isa Spa which is known for its attention to detail. Reviews are strong with some of the best reviews for the entire island. Guests seem to love the peaceful location, privacy in each room and everything that comes with the nightly rates. Located away from it all on the secluded northern tip of Boracay, the Shangri-la’s Boracay Resort and Spa is simply one of the best with 219 rooms in 10 different categories. Each 5-star room features stunning views of either the sea or the landscaped gardens, a private veranda that comes outfitted with a daybed, a flatscreen TV, iPod dock, in-room locker, coffee making area, a mini bar, marbled-floored bathroom with a separate rain shower and bath and a writing desk. The resort also features 5 different bars and restaurants, each with a view and a selection of different dishes. In addition, guests will be privy to 2 secluded beaches, a free-form swimming pool, an adventure zone, diving center, tennis court, entertainment center and a health club. For those who love water sports, you simply can’t go wrong here with access to water skis, wake and knee boarding, kayaking, parasailing, jet skiing, deep sea fishing , banana rides, snorkeling, diving and catamaran sailing. There’s also a large spa on-site overlooking the bay offering a peaceful and relaxing afternoon after a morning of fun on the water. Reviews are beyond impressive, making the high nightly rate seem more than worth it.